work. I shoot in such a way as to deliberately limit the viewer's engagement with my photos. I refer to the work as ‘occluded’ landscapes, meaning ‘to cause to become closed’." 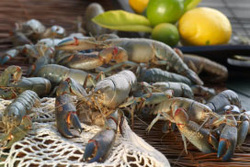 Internationally successful and award winning local produce. Kukerin's Nenke Family business and tourist destination aims to please every palette. Moari Art from New Zealand. Koru is the Maori word for the unfurling fern frond of New Zealand's silver fern. Both the symbol as the baby fern are characterized by an inward, circular or spiral shape. This shape, as well as the fresh fern frond, resemble new life, growth, a fresh start, new beginnings. But koru also, more spiritually, stands for; nurturing, tranquility, purity, personal growth, awakening and positive change. 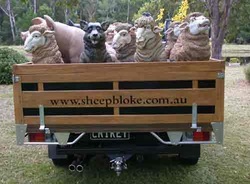 Model sheep and dog heads made for the ute. Rob and Nathan are Victoria's TWO FAT WOMBATS! They are extremely talented at creating fibrecast animals and more.